"You ain't nothin' but a hound dog, just a'cryin' all the time." Who hasn't heard Elvis belt out that rock and roll classic, but did you ever consider the hidden meaning behind those words? Clearly this was a song about the long-term effects of a negative attitude, and the hidden implication is, "put your hound dog out of his misery!" A negative attitude has a way of giving your face and body a whole new look. I call it "the hound dog effect." Your eyes, mouth and overall posture begin to droop, and before long you start looking like a Bassett Hound. The next time you feel disappointed or discouraged, look in the mirror and you'll probably see a touch of hound dog in your eyes. Fortunately, it's a temporary condition for most people, and will disappear as new opportunities and experiences bring a new perspective. "I'm Fine, Under the Circumstances"
For others the hound dog effect has become a chronic condition. Ask a chronic hound dog how he or she is doing and even the rote response, "I'm fine," is generally followed by "under the circumstances." Chronic hound dogs have a way of staying under life's circumstances, shrouded by gloom and cut off from any vision of new possibilities. Murphy's Law has become their motto: "Whatever can go wrong will go wrong." In essence, when the hound dog effect is allowed to become a chronic condition, you develop a highly defective personality. It all begins with chasing rabbits. Hound dogs are attracted to negative thoughts, which like rabbits often run rampant through our minds. Without a hound dog to chase them, these thoughts tend to disappear on their own, but when the hound dog within you rises up, it can't help but chase every negative thought that crosses its path. Elvis sang, "You ain't never caught a rabbit and you ain't no friend of mine." Hound dogs never actually catch the rabbits they chase. Like the term "chasing rabbits" implies, they simply get sidetracked from achieving their goals and instead, become mired in the depression of negative thinking. No one wants a hound dog for a friend. Negative thinking and depressed attitudes are like infectious diseases, and most people avoid hound dogs like the plague. "I'm Tired." This rabbit will try to sidetrack you from putting forth any extra effort to achieve your goals. Follow it and "I'm Tired" will lead you to a whole nest of rabbits where you'll learn to make a habit out of rationalizing your laziness. "I Can't." This rabbit will cause you to give up on any new pursuit at the first sign of difficulty. "I Can't" will help you to accept defeat and failure and build them into your self-image. "I Won't." Chasing this rabbit will take you down a narrow tunnel where your mind will begin to close to new ideas. You'll learn to make "no" your first response to any request or suggestion. "I Won't" will lead you far away from creativity and spontaneity, and will leave you in a state of unwillingness to pursue even your own dreams and goals. "It's Your Problem." You'll learn a new vocabulary chasing this rabbit. "That's not my job" and "You made your bed, now sleep in it," will become familiar phrases as you wander further and further from compassion and empathy toward total selfishness. "It's Your Fault." This rabbit will lead you into the mode of casting blame. You'll soon find yourself blaming your parents, your boss, your company, the government and everyone who makes the mistake of touching your life. "What's the Use." All the other rabbits will eventually lead you to this one. Highly defective hound dogs are usually spotted chasing this rabbit until they finally run out of steam and give up on life. If you can recognize these seven rabbits and control your urge to chase them, you'll be well on your way to neutralizing the hound dog effect in your life. The hound dog rises up in all of us from time to time, but when it does, don't encourage it. Hound dogs love the company of other hound dogs, but you're far better off seeking out positive influences when you're feeling down. 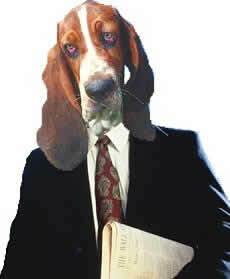 Remember, negativity is infectious, so if you see a hound dog coming your way, run for cover. "They said you were high-classed, but that was just a lie." If the low-classed hound dog in you is "just a'cryin' all the time," it's high time you put him out of his misery. How can you do that? Stop chasing rabbits and start focusing on new possibilities. If you find yourself "under the circumstances," get on top of them where you can get a better perspective. Figure out what you want out of life, set some positive goals and then rock and roll! Check out Buford's motivational keynote, "Put Yer Hound Dog Owtta His Mizzery!"